With the 2012 AFF Suzuki Cup just around the corner, I cannot help but reflect on how different things have become in less than two years. The football landscape, to put things plain and simply, has changed almost beyond recognition. Back in 2010, I followed the national team’s performance in the Suzuki Cup’s qualifying round by way of whatever two- or three-paragraph reports that I could find posted over the Internet. I watched highlights of the matches against Timor Leste, Cambodia and Laos on YouTube. I looked forward to seeing the national team again on StarSports, which had covered the tournament from when it was still known as the Tiger Cup. Not having watched any of the qualifying matches in full, I was determined to watch as a matter of patriotic obligation but also with a come-what-may attitude. We have outgrown our traditional tag of minnows and a game against us can no longer be considered a straightforward three points. After all those years of waiting, we have arrived as a footballing nation. After all, watching live matches of the national team in the past could often be unpleasant experiences for which the only question to be answered was by how many goals. I arrived home in the evening from training with my own team in time to catch the second half of the opening fixture against Singapore; and was pleasantly surprised to see the Philippines holding the former champions. When Alexander Duric finally scored in the 64th minute, the feeling of déjà vu was unmistakable. Singapore could have added to their score; but the boy Neil Etheridge was proving to be a particularly defiant barrier to breach. I would have been happy to take a 1-nil defeat as a sign of progress and the avoidance of an embarrassment; but the boys did the unthinkable in the dying moments of the match and had the utter gall to chase the game and poach a goal almost at the death. Then came the game against Vietnam which nobody as yet had a clue would become the certifiable turning point to the fortunes of Philippine football, the miracle that those like me prayed would happen but nonetheless pragmatically and resignedly accepted would probably not. As expected, the defending champions wove dizzying patterns to reduce the Philippines into virtual spectators. But wait; they were being forced to shoot from outside; and that boy Etheridge was again standing tall and safe between the posts. In fact, the first significant chance of the game was when Ian Araneta snapped at a ball from a corner and sent it crashing off the far post. Dare we actually? That question was soon answered when Chris Greatwich somehow twisted his body to send a most improbable header past the Vietnamese goalkeeper for the game’s opening goal. How the can of beer that I was holding stayed in my hand, I cannot to this day explain. Of course, there was still a lifetime of football to be played; except that Etheridge was making the sort of saves that in all honesty he or any other goalkeeper had no right to make. I started to get this strange feeling that this was going to be our against-all-odds day! Indeed, when Phil Younghusband helped himself to a second serving after his first shot was parried away, his goal merely confirmed my earlier suspicion that it was going to be a famous win and a colossal upset. Post-game, there was that quick shot of that sore loser Calisto waving away Simon McMenemy with his limp wrist. I wonder now in retrospect how much Calisto, with his utter lack of sporting grace, might have unwittingly fuelled football’s subsequent resurgence in this country even more. His scathing and ill-advised remarks in a post-match interview were, after all, an affront to an entire nation. In contrast, young Simon McMenemy was the epitome of grace and sportsmanship. Against Myanmar in the final group match, it did not bother me too much that the boys were making a real labour of trying to get a goal – because Myanmar never really looked like scoring. I remember the match more for the hasty attempt by one of the local networks to cover it live on primetime. I tried giving the local coverage a chance; was horrified by the commentating; and hopped straight back to ESPN. On to Jakarta for what must have been the most ludicrous home-and-away tie ever, both to be played at the Bung Karno. The Fil-Foreigner issue was not such a big deal yet; and if only the critics could have been bothered to watch Christian Gonzales be the difference between the Philippines and Indonesia over the two legs. No, the gentleman in question has not one ounce of Indonesian blood flowing through his veins. And yes, he scored a goal in each of the two matches against the Philippines to put Indonesia through to the finals against Malaysia. Disappointing, yes; but since nobody expected us to get that far in the first place, whichever way the tie went, the boys had already outdone themselves and had every reason to be proud. Besides, as subsequent events showed, Jakarta was not the end at all. It was just the beginning! Before long, the federation had tied down a groundbreaking television deal with a local network; made arrangements for a change of national team coaches; continued to scout for new and better players; and shifted its focus to the Challenge Cup. The resurgence of interest in the game spilled over to the club scene; and soon, even the United Football League was inking its own deal to give club matches television coverage. A large crowd attended a club cup final even though the match was broadcast live; and one local club was invited to play in a competition organised by the Singapore FA. We enjoyed a mini-run of World Cup qualifiers; got visited by the LA Galaxy, CFC Madrid and Incheon FC; placed third in the Challenge Cup; and played a string of friendlies against our Southeast Asian neighbours, only getting beaten once in a badly officiated game in Vientiane. In recent weeks, we won our first international tournament in just short of a century; and concluded a Middle East training camp which included a draw and a narrow loss in two friendly internationals against Bahrain and Kuwait, respectively. 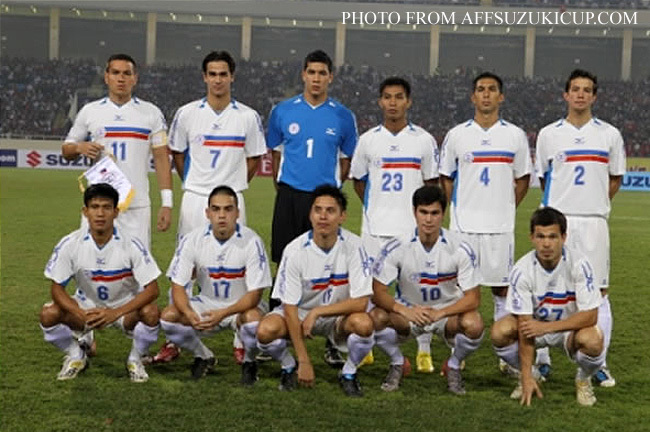 When the Philippine team flies out to Bangkok for the 2012 AFF Suzuki Cup late next month, whether or not the European-based players travel, it will be reasonably stronger than the 2010 team, such is now the pool of talent at the disposal of the coaching staff. The games will be broadcast live into the living rooms of households across the Philippines; and many fans, even the new ones, no longer need to have the offside rule explained to them. At the stadia, there will be Filipino fans in replica jerseys or souvenir shirts waving flags as they have done lately wherever the Azkals play. I ask myself, how could all these have happened in a mere two years?